Here’s a very easy to grow May-June bloomer that has never caught on to a huge extent, and I don’t know why. 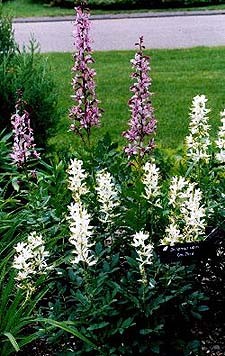 Killer spikes of pink or white flowers (both pictured) last three weeks on tall (upwards to four feet) erect stems that don’t need staking. Its dark green, compound leaves are much more interesting and add more to the garden than those of, say, tall phlox, asters, boltonia, or any number of other vertical high-risers. Performs just fine anyplace you can wangle four hours or more of full sun, plus it’s hardy to Zone 3. I don’t get why more people don’t grow it. Plant at the middle to back of the border in soil well amended with organic matter. Prefers neutral to alkaline soil, so if your soil is acidic, this is one time I’ll let you use a little lime. Though long-lived, plants may take a few years to become established. It’s a slow grower, so division is usually not necessary. If you do divide, it’s best to leave the plant in the ground and slice it in half with a sharp shovel, removing only half and leaving the rest in place. That’s the long-winded way of telling you that divisions often don’t make it. Does not benefit from deadheading. In fact, it’s best to leave the thing alone after blooming and allow the star-shaped seed pods to develop, and remain through the winter. Cut to the ground in early spring. The common name is derived from the fact that the stems emit an ignitable mist when pruned, or so I’m told. Though not poisonous, flowers and foliage have been know to cause a mild skin irritation to some, easily remedied by the use of gloves when handling.